A gray whale pops up for air in Baja California, where advocates of tourism and the environment clash with those favoring heavier development. LAGUNA SAN IGNACIO, Mexico, March 7 — This remote lagoon, surrounded by salt flats, mesas and desert, has been a sanctuary for gray whales for centuries. Every year they return in January to these quiet, protected waters to give birth and nurse their calves through the first few months of life. Then they mate again in a swirl of water and fins, and frolic in the warm waters, breaching and flopping their gargantuan bodies. Fishermen, who serve as guides during the whales' three-month stay, ferry tourists to the center of the lagoon, and the whales play with the boats. Sometimes, enthusiastic visitors can pet and scratch the leviathans' blubbery, sensitive skin. But the lagoon has proved a powerful draw for more than just nature lovers. The area's salt and oil deposits have long drawn development interests, pitting environmentalists and local fishing and tourism concerns against big companies and land speculators in battles that have intensified in recent years. In 2000, for instance, environmentalists won a long-fought victory over the Mitsubishi Corporation, which had sought to build a giant salt-mining complex on the lagoon, which would have devastated fishing and the whale-watching industry. Another company, Exportadora de Sal, has received a 50-year concession from the government to mine salt, suggesting another looming battle. Environmentalists also say that plans to exploit oil deposits near the lagoon and build a big marina near its entrance threaten the whales. From ecologists' standpoint, though, perhaps the greatest threat to the lagoon is the land boom that is sweeping the peninsula. All across the Baja California, land speculators are buying out members of ranching and fishing cooperatives, which own vast tracts including beaches on some of the most pristine and rich marine habitats in the world. But here, environmental groups have reached an unusual agreement with a cooperative that will help protect the lagoon, the last undisturbed gray whale nursery, from industrial development or land speculation. Under the accord, the cooperative, the Ejido Luis Echeverría, has agreed to protect 120,000 acres around the lagoon from development, in return for a $675,000 trust fund put together by several groups, among them the Natural Resources Defense Council and Wildcoast. Trust earnings go to the cooperative to be invested in projects to create permanent jobs and give its 43 members a stake in protecting the whales and their habitat. "This is a long term project, a project for perpetuity," said the president of the cooperative, Raúl López. "We have to be an example for the other cooperatives." Still, the Echeverría cooperative is only one of six that own land around the lagoon, and the environmentalists have their work cut out for them persuading the rest to commit themselves to protecting the whales. Serge Dedina, the executive director of Wildcoast, has tried to convince the cooperative members that they have more to gain in the long run from developing tourism around the whales, as well as sustainable fisheries, than from a one-time windfall of cash for their land. 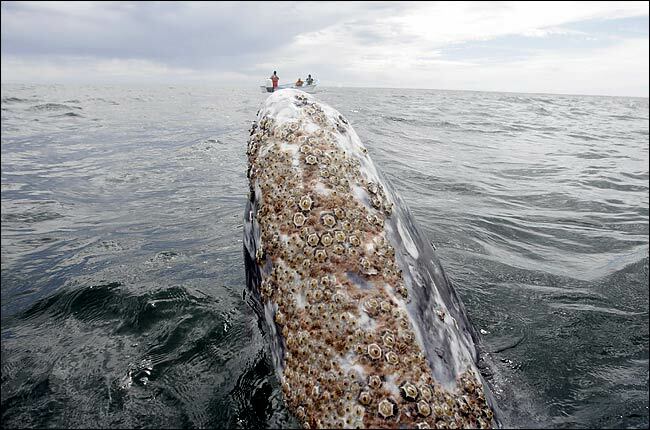 The gray whales migrate every year from the seas off Alaska to Mexico's waters. They begin arriving in January and stay until early April. The lagoon, along with two other less pristine bays, are vitally important to their survival, since it is here the mothers give birth and here the calves gain enough strength to handle the perils of the open ocean. The lagoon is also home to 221 bird species. Ospreys, cormorants and pelicans fish the waters, while falcons, gold and bald eagles sweep the skies. Rare species like endangered peninsular pronghorns and green sea turtles can be spotted here, too. The whales are the big draw, however. Eight camps are scattered along the southeastern shore of the bay and 16 boats have permits to take tourists out. Mr. López said that the idea of the local cooperative, or ejido, was that the trust fund's support of small projects would bring in jobs and erase the temptation for people to sell out to mining or other development concerns. But leaders of other cooperatives around the bay are not convinced. To the north, the San Ignacio Ejido is controlled by ranchers and businessmen who have little or no stake in the whale-watching business. Their president, Rodrigo Martínez Zapien, a grocer, said most of the 81 members were ranchers or small-business men and would support selling their beaches to a salt-mining company or anyone else who would produce jobs. Already, they have been approached by land speculators, he said. "The truth is there is not much interest in going to exploit this business of the whales," he said. Others say they see the whales as a resource. The whale tours are a lot less work than hauling in fishing nets. And the money from the trust will help small businesses that provide jobs. The only other option, they say, is to sell, move to the city and run through the profit. "Sure there have been people who have come around wanting to buy, but for us it doesn't interest us to sell the land, because almost all of us work in tourism now," said one local fisherman, Alejandro Ramírez, 35, who works at a whale-watching camp. "If I sell out, sure, I'll have more money, but money in your hands goes quickly, and with this natural area my family has a way to make a living for a long time."